Available at hardware stores or specialist contractors, rain barrels can be attached to the downspouts of your rain gutters, enabling you to potentially save hundreds of gallons of water. Many of these rain barrels have spigots attached to the bottom, enabling you to set up a natural irrigation system with drip hoses or otherwise. 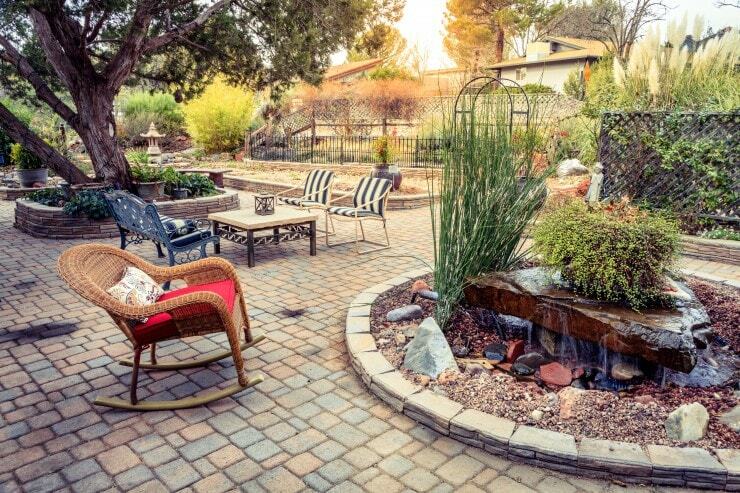 By using less grass and plants that are more appropriate to the climate, you can have a beautiful garden that consumes far less water. The garden doesn’t need to be all cacti and rocks — your local nursery or landscaper can assist you with suggestions. Placing organic mulch around plants encourages better plant growth and development, and makes all landscape maintenance operations easier. Mulch helps conserve water by insulating and protecting the soil from the hot California sun, reducing the drying and hard-baking effects caused by evaporation. It is important, however, to ensure that the mulch doesn’t crust over — a thick layer of mulch can form a crust, preventing water from soaking into the soil. To prevent this from happening, use a rake to break up crusted mulch. Put the water where the plant’s roots can reach it — avoid soaking the foliage of a plant, and avoid spraying water outside the root zone of a shrub or perennial plant. If you notice water running off or forming a puddle, stop and let the water soak into the soil before continuing. Also, remember water that runs off onto a paved surface doesn’t do any good. Likewise, when using a lawn sprinkler, ensure the water hits the lawn and not the driveway or the sidewalk. When using a standard garden hose and nozzle, a lot of water gets lost as mist, evaporation or runoff. Soaker hoses and sprinkler wands are wonderful tools when watering, as they perform more efficiently. A general rule-of-thumb is that a lawn needs roughly one inch of water per week, whereas perennial plants and shrubs need one to two inches per week. If you are watering annual plants, check the plant tag — the small spear-shaped plastic tag that comes with the plant when purchased — as it will tell you the water requirements. If you are unsure, keep the plant’s soil moist and check to see how the plant is responding. If the plant begins wilting, add slightly more water and continue to check it. Beware of overcompensation — overwatering leads to root rot and may compact the soil, hindering the roots’ access to air. Your local plant nursery likely sells a tool to help gauge the moisture level of the soil. If you don’t have such a tool, it is possible to use a large flat screwdriver. Poke the screwdriver into the soil to check the resistance — the greater the resistance, the drier the soil. Watering in the morning, when the air is cooler, helps water soak in before evaporation takes place. Also, watering in the morning helps the plant absorb the water throughout the day. When watering at dusk, or in the early evening, you risk the formation of fungus, as these organisms tend to thrive in places where it is dark and damp. Also, watering in darkness reduces your visibility and therefore your level of precision when watering. In times of severe water restriction, it may be necessary to prioritize. Remember that the front of the house is more important in terms of improving its overall look and value. Focus on the front lawn first, and don’t worry so much about the back yard. With perennial plants, as well as your lawn, larger amounts of water at more widely-spaced intervals helps prevent shallow rooting. In hot weather, it is generally recommended to water perennial plants every other day, and shrubs every three or four days. Of course, it is also recommended to monitor the moisture content of the soil and adjust the intervals as necessary. Annual and potted plants can be watered as needed. Remember that potted plants can’t obtain any moisture from the surrounding soil, so it’s imperative to keep the soil moist. Avoid using a hose that’s been coiled up and sitting in the sun all day, as that hose can act like a water heater. Heated water can place undue stress on sensitive plants. Instead, store your hose in the shade, or run out the heated water before you begin watering. If you have more questions about how to set yourself up to conserve the maximum amount of water, don’t hesitate to give Rain Gutter Pros a call.